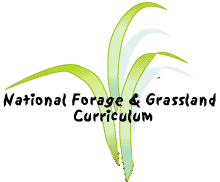 It is often easier to study the various characteristics of forages individually. Other lessons in this curriculum focus on weeds, irrigation, species, and other isolated traits. Workshops, conferences, and meetings often deal with separate factors. However, with enough basic information presented, it is important to develop the skill of viewing the entire forage-livestock system. The childhood game of LIFE is an example of a simplified attempt to understand how things interrelate. Forage-livestock operators face some of the same features as the game of LIFE. There are some time and chance factors and some hidden perils, but unlike LIFE the manager has a lot of opportunity to apply knowledge. The basic principles for understanding and developing a forage-livestock system are simple, though the daily decision making may not be. Since the plants must interact with the soil and climate, proper species selection is critical. Carefully considering the adaptation of a species and the environment conditions of a specific location will lay the best foundation for successful forage production. Where broad-brush, general adaptation maps were all that was available, new technology and collaboration of agronomists, climatologists, geophycisists, and and related scientists are making specific species selection very possible and and practical. Soon farmers and ranchers will be able to determine what will optimally grow on each section of their land. These new efforts carefully view plant requirements interrelating with soil and climate characteristics. Another basic to operating successful systems is the constant effort to reduce the losses of nutrients and prevent water pollution. Essentially, managers are constantly aware of how to contribute to productive growth of forage plants and maintain good water. Both nutrients and water function within cycles. The nitrogen cycle and water cycle should be well understood so potential hazards are avoided and beneficial functioning is sustained. Maximize nutrient usage and water quality. Since forage production varies in quality and quantity throughout the year in response to climate, forage-livestock operators must wisely match the feed with the livestock. This assumes an understanding of the nutritional needs of of the various classes of livestock. Lactating dairy cows have different needs than sheep raised for wool. But both animals will eat year round and the available feed will vary in yield and quality. The last basic foundation of forage-livestock systems is planning all grazing to benefit the growth requirements of the plant. Grazing from the view of the plant will give the best nutrients to the livestock in the long run. Wise forage-livestock operators integrate what is being grown with how it is grown and consumed and how to ensure that the natural cycles involved are sustained.